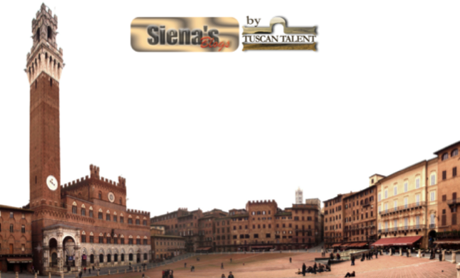 Tuscan Grapevine is updating its section on what's on in and around Siena. The "Art & Culture" section provides all the necessary information for the coming month. Visitors to Siena usually make the magnificent Piazza del Campo their first port of call, and no wonder! There are 11 streets which slope down into the square, and that first sighting from above never fails to take one’s breath away. The months of July and August are particularly crowded with tourists, many of whom flock to see the famous traditional medieval horse race, the Palio, which takes place there at this time. 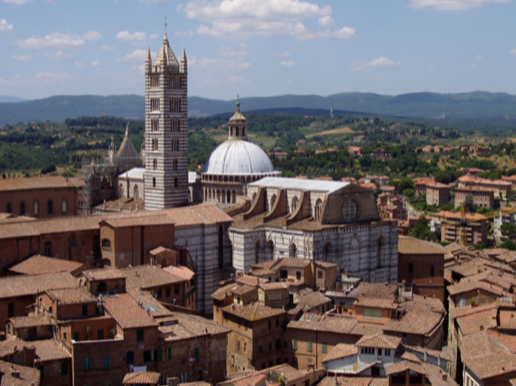 However, Siena like Florence is full of Tuscan treasures, some of which can be seen each year shortly after and in honour of the Palio event. 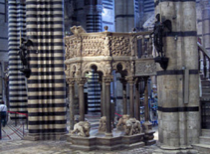 On18 August, visitors to Siena Cathedral can admire the stunningly beautiful marble pavimento of the duomo, which is unveiled to the public for a temporary period only, until 24 October. 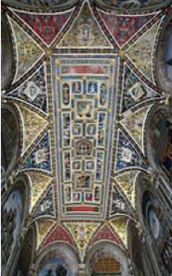 It is divided into 56 panels covering the entire floor of the Cathedral, in various geometric shapes and sizes, and the most important Renaissance artists from Siena - around 40 of them - were involved in the design. Work started on the panels in the 1360s and continued until the middle of the 16th century. These spectacular marble inlaid pieces depicting vivid stories from the Bible and classical antiquity were implemented using a special technique called “commesso marmoreo e a graffito” which was unique to Siena. The only exception is the second panel in the central nave, which was executed in mosaic. This etching technique consisted of drilling tiny holes and scratching lines in the marble and then filling these with bitumen or mineral pitch. Siena’s Roman origin led to its emblem of a she-wolf suckling the infant twins, Romulus and Remus. The legend has it that Rome was named after Romulus and Siena after Senius, the son of Remus. There are other possible name derivations but the emblem stayed, and there are art works all over the city of Siena depicting its form. 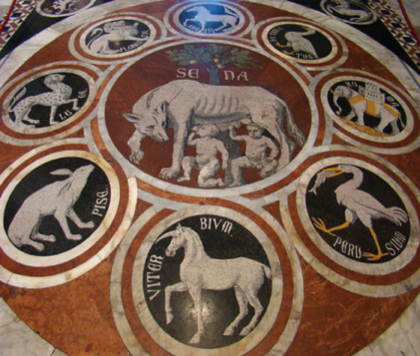 Here in the cathedral, near the entrance is the panel of the She-Wolf of Siena surrounded by the emblems of other nearby cities such as Rome and Pisa. It is one of the oldest works, probably dating from the 1370s. These old panels were first restored in the 1860s, having been worn down over the centuries by the tramping feet of pilgrims and tourists. The large panel, The Slaughter of the Innocents was probably designed in around 1481 by Matteo di Giovanni and can be found in the transept. Usually open to view throughout the year, it is based on an account from the gospel of St Matthew, unlike the other floor mosaics in this section, which represent stories from the Old Testament. The detail and colours are quite remarkable. Another masterpiece in the Cathedral is without question the spacious Piccolomini Library which leads off from the left-hand side of the nave and which houses precious illuminated choir books. Covering the ceiling of the library are colourful painted panels depicting mythological subjects. The frescoes in the main part of the library were painted in 1502-3 by the renowned Renaissance artist Pintoricchio and members of his workshop, including a young Raphael. They depict the life and career of cardinal Silvio Piccolomini who became Pope Pius II, a much loved and revered son of Siena, the library having been commissioned by his nephew, the archbishop of Siena to house his uncle’s books and collection of manuscripts. These frescoes are absolutely stunning to behold and well worth a visit. Entrance to the Cathedral costs €6 and it is open from 10.30am until 7pm. Photography and filming of any kind is forbidden but a pair of binoculars can be a useful addition for those who want to be able to view the far-off sections of the floor more easily. The Cathedral is usually very busy and guides often have to lower their voices, but as an alternative, an audio guide is available and very informative. There is still time to see this wonderful marble floor before the wooden protective flooring is put back in place after 24 October, and of course there is always next year!